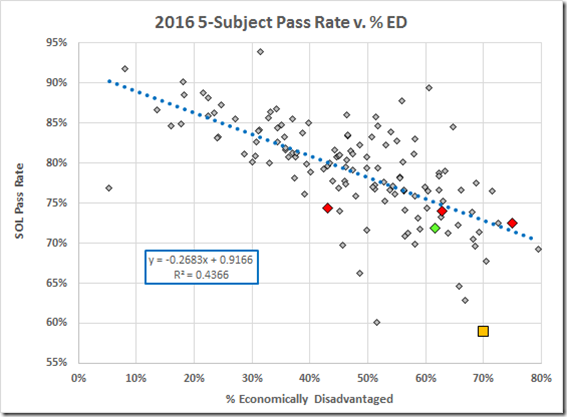 ﻿ The excuse we often hear for Richmond’s poor performance on the SOL tests is poverty. VDOE has data on that. They define a student as “economically disadvantaged” if that student “1) is eligible for Free/Reduced Meals, or 2) receives TANF, or 3) is eligible for Medicaid, or 4) [is] identified as either Migrant or experiencing Homelessness.” Data (Fall enrollments) are here. 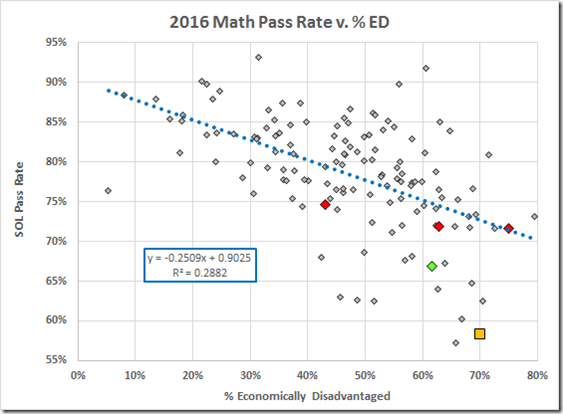 With an R2 of 39%, it appears that ED is a considerable influence on the pass rate. 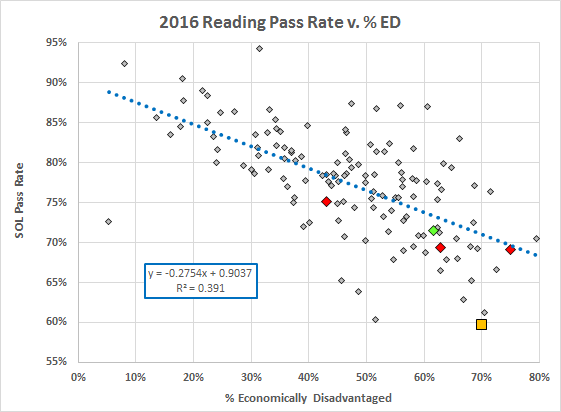 Even so, Richmond (the gold square) underperformed not just the peer jurisdictions (red diamonds, from the left: Hampton, Newport News, and Norfolk) and not just the divisions with similar rates of poverty, but all of Virginia’s school divisions, higher poverty or not. 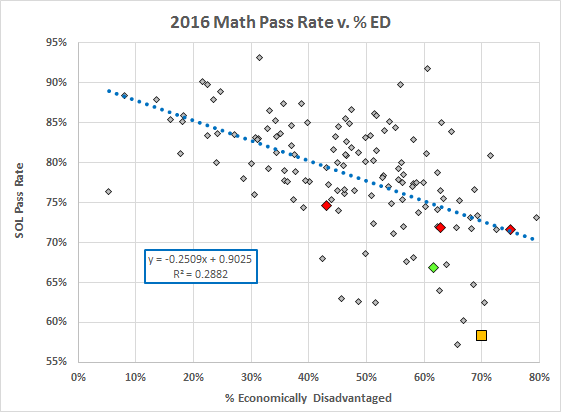 Richmond’s math performance was nearly as dismal, beating out Lancaster County. 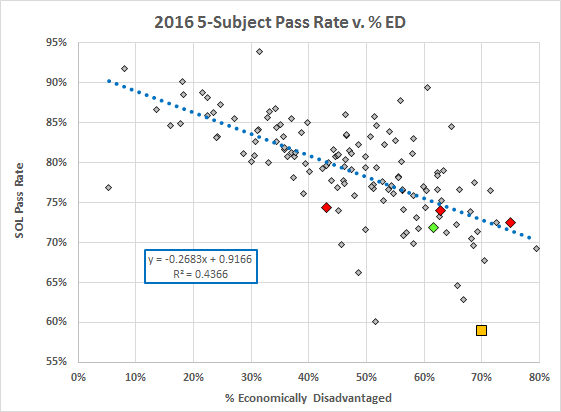 The five-subject pass rate also was perfectly dismal, notwithstanding the larger R2. 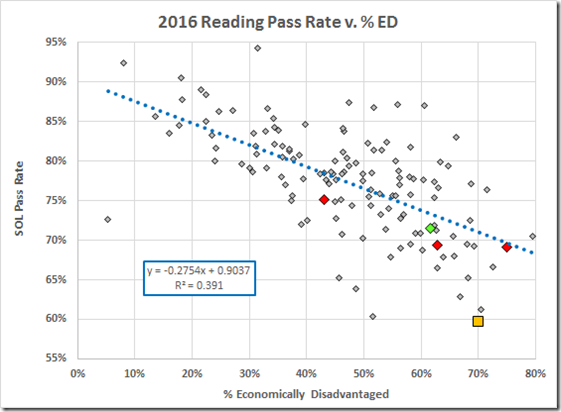 Anybody who uses poverty as an excuse for Richmond’s lousy SOL scores is an ignoramus or a liar. Or both.